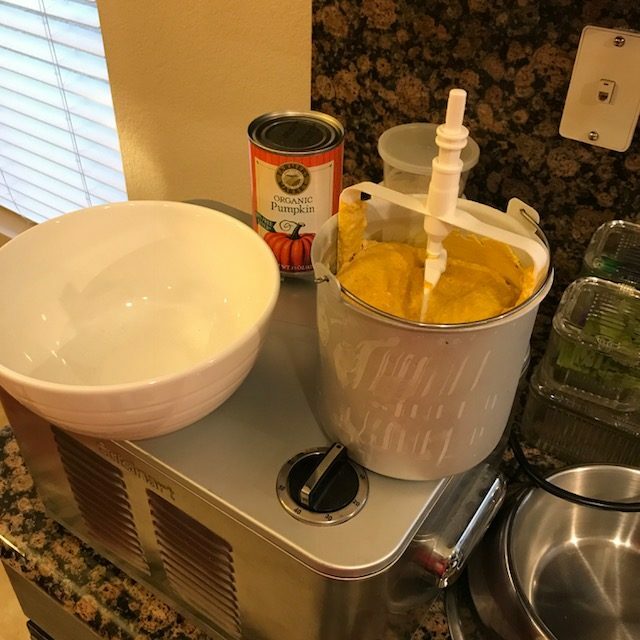 Discover your own “gelato moment” with this easy to make Pumpkin Gelato. I had this fantastic Pumpkin Gelato at Nostrana last week while visiting my daughter for her birthday. So today, I tried to replicate it with great results (it is fantastic and I can imagine it would be a huge hit at Thanksgiving too). Put all ingredients in a bowl and mix with a whisk until well mixed together. Place in a cuisinart ice cream maker and mix for 30 minutes. For the gelato, remove from the ice cream maker and put it into a bowl. Freeze for 24 hours. If you’re okay with ice cream, just keep going with the ice cream maker until the ice cream is firm. Gelato though has less air in it – so for a real gelato experience, remove before it’s completely frozen. I hope by enjoying this pumpkin gelato, you can discover your own gelato moment – and with it, the absolute perfection of your entire life. You need whole sockeye salmon, canning jars (1 pt jar per pound of salmon), white vinegar, pressure cooker, non-iodized salt, 1 lemon, sharp filet knife. Catching the sockeye requires you first know where to go, when, and how to do it. Then you have to legally get them in a drift net. It always helps to fish where the fish are and not be arrested while doing this. For us this time, they were near the shore on the southern part of the Chilkat Inlet two hours before high tide a couple days after the first full moon in August. And yes, Fish and Game came by to verify we had the right subsistence permit. We did miss the big sockeye run in the Lutak Inlet by a week. In years past I’ve had friends who hit their daily possession limit of 25 fish in less than an hour by being in the Lutak Inlet during one of the season’s sockeye runs. Next year I’m going to check with Fish and Game to find out the fish counts on the Chilkoot River Weir and the Chilkat River Fish Wheel. 1. Remove the head, guts, fins. 2. Soak in cold water with a couple tablespoons of white vinegar to remove the slime. 3. Can within 24 hours of catching the fish and keep the fish on ice until you can them. 4. Dry off the fish and remove the slime (many of the scales will come off too) – use a dry clean towel. 5. Prepare the jars – wash in the dishwasher – both jars and lids. 1. Cut the fish into steaks – about one and a half inch thick. You cut through all the bones. Canning is cooking the fish at high pressure and there are many nutrients in the bones and the skin that are edible and preserved with this method of preparation. 2. Place one steak and a couple extra pieces per jar (pack the jar full). 3. Fill the jar with cold water to about 1/2 inch below the top of the lid. 4. Put in a small piece of lemon if desired and 1/2 tsp of non-iodized salt. 5. Clean off the rim of the jar with a paper towel of clean dish towel. 6. Put the lids on and seal tight. 3. Put one or two layers of jars in the pressure cooker. 4. Seal the lid – make sure the lid top arrow lines up to the line on the pan. Tighten the bolts one at a time on opposite sides to get an even seal. 5. Put the pressure weight on the steam hole on the ten pound slot. 6. Put the stove on medium high to high. 7. Once the pressure weight starts to shake – look at the pressure gauge. It should be reading ten pounds (this is for at sea level). Watch the gauge – if it goes too high, reduce the heat. 8. Time 100 minutes from this point. 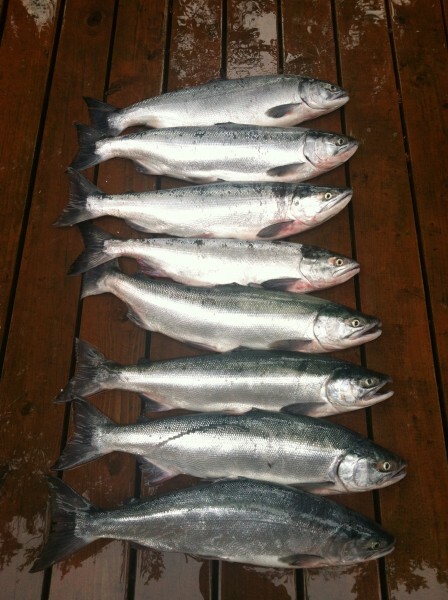 After 100 minutes, you are done canning the salmon. 10. Remove the jars and let cool. 11. Tap on the lids – if it is a high pitched tinging sound – the seal is good. If it is a low pitched, thud, the seal is not good – refrigerate this jar and eat soon or freeze. I use the canned salmon to make salmon salad – kind of like tuna salad with celery, mayonnaise, pickles. I also use it to make salmon burgers. Need all the same ingredients and tools as for canning. Need a smoker, a fan, racks, smoking chips, 1 cup brown sugar, 1/2 cup salt (non-iodized) per ten pounds of fish, lots of space in your refrigerator for the salmon. Put the smoking chips in a bowl and soak them in water. 1. Mix the brown sugar and salt (ratio – 2 times as much brown sugar as salt). We had five fish, about 8 pounds each and used 4 cups of brown sugar and 2 cups non-iodized salt. 2. Cut the fish into 1/2 inch steaks. 3. Rub both sides with the brown sugar and salt mixture. 4. Put on a tray and put in the fridge for at least an hour but no more than 24 hours. 5. Rinse each salmon steak in cold water. 6. Put each salmon steak back on the tray (better than a cookie sheet as it’s easier to dry out). 7. Put the trays in front of a fan (we have an oven that blows a fan with no heat). 8. Once the salmon steaks look shiny on top – they are done drying (takes about an hour or two). 1. Put the glazed salmon steaks on greased racks from the smoker. 2. Put the wet smoking chips in the bottom smoking tray. 3. Smoke for four hours (eight if you are not canning). 1. Pack the smoked salmon in the cleaned canning jar. 2. DO NOT fill with water. Put the lids on and seal tight. FOLLOW THE SAME INSTRUCTIONS AS ABOVE FOR USING THE PRESSURE COOKER. We use the smoked canned salmon for spreading on crackers and for just eating plan as appetizers. This is a huge hit at parties. Hit the 500 mile walking mark on my 1000 mile walking goal in a month of tragedy and triumph!! This was the view from my Mom's hospital room after her brain biopsy. 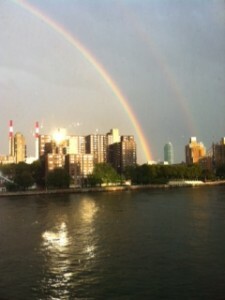 A wonderful sign that there might actually be a pot of gold for all of us out of this whole experience. I hit the 500 mile point in my walking goal on July 3rd. The rest of July though was fraught with two significant distractions – an unplanned week long stay in NYC to be there for my Mom undergoing a brain cancer biopsy and managing a very painful digestive problem. Plus the heat and humidity in the river valley where I’m staying has made it unbearable to be outside walking after 8 AM or before 8 PM. I’m starting August having to play catch up. The good news, I am in fantastic shape from all the walking, swimming and tennis. And it’s no problem to bust out 7 or 8 miles in under two hours. I added playing tennis 50 times to the end of the year to my thousand mile walking goal. Switching to a Vegan lifestyle has been made much easier with the fantastic support from Teri Cummings - our holistic health counselor. And I am adopting a total plant based diet for the next six months. I made this rather drastic move initially to support my Mother’s recovery from brain cancer. We found out three months ago she had an inoperable brain tumor. We immediately went into high gear to help her heal from this and the tumor has not grown based on the changes she was able to make to her diet and lifestyle. 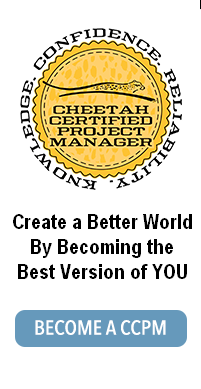 I have led the alternative treatments – one of which has been a mostly plant based diet. I wasn’t as strict with it myself and until recently cheated quite often. The very good news, that while we recently discovered her tumor is an aggressive grade three type of tumor, it has not grown in three months since they discovered it. 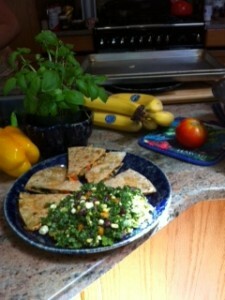 Now the plant based approach to eating is my preference too – it helped heal my digestive ailments. And just what am I going to do with all those cattle? The loaf may have been an accident, but the result was delicious! Initiation – This is by far the best loaf of bread I’ve ever made. Now the question is, can I repeat it. The whole loaf was made because of other things going awry. The first event was a house guest mistaking the hard red wheat berries for rice. After the second pass through the rice cooker, we were both wondering just why the rice was not getting any softer. Until I asked her where she got the “rice.” When she pointed to the buckets where we store the wheat, I knew the problem. Now I had four cups of very soft wheat berries. 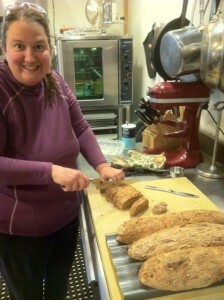 The next “mistake” was in milling three times more durham wheat flour for the pasta than we needed. Left with four cups of semolina flour, and everyone visiting having had way more pasta than they wanted to eat again in a week, I didn’t just want to leave it lying around to oxidize it’s way into the standard fare you can purchase in the store. 3 cups milled hard winter red wheat berries. This is where the mistakes continued (thank god). I mixed up the dry ingredients first. Then added enough warm water to make a nice elastic dough – just a little this side of sticky. Okay, yes I know that this is not that much information. Once you start to make bread as the only way you’ll eat bread, you will know what I mean. I forgot to add in any sugar. The dough was made and had been adequately kneaded. I figured, what the heck, it was a failure loaf anyhow. So I just tossed in half a cup of molasses and put on the kitchen aid for another ten minutes. Went back to the computer, answered a few more emails. When I smelled the mixer starting to over heat, was reminded what I had going on in the kitchen. 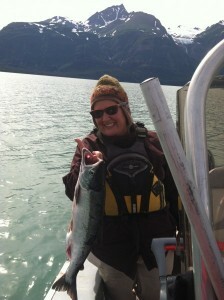 Turned off the mixer, covered the bowl with some saran wrap and went off to the next alaskan adventure with my guests. We got home five hours later to the dough that had taken over the kitchen. One of my guests had shown up with my french bread pan from Connecticut. I rolled out three loaves for the pan, and shaped the rest of the dough into a small round loaf. We again left for our next adventure, not returning to the kitchen until early the next morning. The loaves had again tripled in size. I popped it all into a pre-heated 400 degree oven for 15 minutes. What emerged was the lightest, tastiest whole wheat bread I have ever made. None – that was the joy of the accidental loaf. Make sure to use a VERY sharp bread knife when cutting into light and delicate breads. I’m not sure if I can ever repeat all the circumstances that went into this absolutely perfect loaf. I have to remember this as one of my key learning lessons in life. Accidents and mistakes often lead to the most amazing outcomes. Relish and embrace them. Initiation – I had this soup at a small little greek restaurant. It seemed so simple so I reverse engineered it. You can easily adapt this as a vegan recipe – just use olive oil instead of butter and vegetable broth instead of chicken broth. Planning – This is a very simple recipe and fast. 1. One head of Escarole – just use the green leaves, not the stalks. 2. One yellow onion – chopped. Saute the onions and crushed garlic in the olive oil or butter. Add in the escarole. Saute until it shrinks. Add in the white beans, salt and pepper. Saute for a few more minutes. Then add the broth. Heat thoroughly. Do not brown the onions – saute until translucent. Taste before adding more salt. It’s a bit hard finding the escarole but this is what gives this soup it’s punch. Do not substitute another green. Initiation – Jean, my lovely sous chef for making this soup wanted the recipe. Okay, I need to confess, being the sous chef requires you do pretty much ALL the work for this soup. Jean – find yourself a sous chef and this soup becomes VERY easy to make. Planning – as stated above, the first requirement for making this soup is having someone capable of using a sharp knife without injuring themselves to help you. You (or they) will be cutting a LOT of vegetables into small bits. You will also need a large stock pot. 2 cups softened large white beans (canelli beans, lima beans or some other white beans – not Fava though as some folks have a unknown severe allergy to fava beans). Wash and slice the leeks. Place them into the stock pot on very low heat with the olive oil. You are going to “sweat” the vegetables BEFORE you add the water. This releases much more flavor into the final soup. Keep the temperature low – you are not browning anything in this recipe. While they are sweating, peel and thinly slice the garlic. Add to the leeks to sweat the garlic as well. Finely chop the basil and oregano. Add this to the sweating vegetables. Peel the acorn squash. Remove the seeds and put aside (you can roast these later to munch on). Dice the acorn squash into 1 inch squares. Add to the sweating vegetables. Cook for about 20 minutes BEFORE adding the tomatoes. Cut the tomatoes into the same small squares – skin, seeds and all. Add to the sweating vegetables. sweat for another 15 minutes. Add the softened beans. sweat for another 15 minutes. Put 4 – 8 cups water (depending on the volume and thickness of the soup you want to make). Heat slowly. Then add the left over pasta. This recipe is a take your time type of thing. It is good if you are multi-tasking with this making other things – like making bread, posting other recipes in your blog, etc. Make sure anyone you have helping you knows to keep the temperature low on the stove – especially when you add the tomatoes. If the temp gets too high, the tomatoes lose their shape and the soup looks like it has tomato puree in it instead of just little bits of tomatoes. Also, make sure the acorn squash is mostly cooked (slightly firm and not mushy) before you put in the tomatoes. This is a great soup to put in little containers and freeze. I use glass bowls with good lids and move it right to the microwave for a nice lunch. Initiation – My cousin, Hugh Moran, an executive chef for Budhakan in Philadelphia, made a version of this while he was the executive chef for Cheetah Learning’s office in Windsor, CT. I make this when I have a big crowd for dinner. 1. Thinly slice potatoes, garlic, and onions – use a food processor or a mandolin to speed this up. 2. Grate the cheese (use the food processor to speed this up). 3. Use 1 tbs of the butter to grease a large backing dish – at least 12 x 15 inches (you get get the aluminum large ones in most grocery stores). 4. Layer the ingredients in four layers – potatoes, onions, cheese, cream, butter then start again with another layer of potatoes, etc. Sprinkle the layers with salt, pepper and a dash of nutmeg. 6. Cook in a 375 oven for 90 minutes. After 90 minutes, check. If the potatoes are soft, it is ready. If not, put it in the oven for longer and recheck every 15 minutes. This is NOT for people on low fat, low salt, low carb, low calorie diets. It is very decadent and very good. Initiation – I use this blog as my own personal log – and I find myself coming here frequently to check on my own recipe favorites. AND people who participate in my culinary experiments always ask me for the recipes. I’m sharing some of my classics. This one is absolutely amazing. I modified it a bit from a cook book called Italian kitchen based on my several decades long experience grilling eggplant. Selecting and Preparing the Eggplant – You can use large eggplant and slice it about 1/2 inch thick or use the more narrow ones and quarter it. This recipe calls for two large eggplants or you can use 8 small ones and quarter them. Sweating the Eggplant – At french cooking school, we were told that if you get eggplant fresh from your garden there is no need to salt it prior to using it to remove the bitterness. Seeing that I would only get eggplant from my garden for several weeks of the year, my practice is to start any recipe requiring eggplant, to “sweat” the eggplant FIRST. To sweat the eggplant, after you slice or quarter it, sprinkle it with a little salt. You will see it start to sweat. Dab off the sweat with a paper towel. Flip it over and salt the other side. Again, dab off the sweat with a paper towel. It’s now ready to use. Brush the eggplant with olive oil – use a good brand. It makes a huge difference. Let sit for about a half hour. I make my dressings at least an hour before use because it give the ingredients time to blend. For this dressing, you need 1/2 cup extra virgin olive oil, the grated peel and juice of one lemon, 2 tbs balsamic vinegar, 1 tsp sugar, 1/4 cup coarsely chopped mint, dash of pepper and salt. Put the eggplant on the grill and cook until it is soft and translucent. Cover the grilled eggplant with the dressing. Serve immediately. This is an eat it as it comes off the grill item. This very rarely makes it into the kitchen. Make sure to make the dressing ahead of time before you put the eggplant on the grill. Thanksgiving 2010 – the best of……. 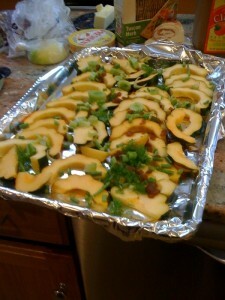 Acorn Squash and Fennel BEFORE putting on the Brown Sugar Liquid. Initiation – My garden this year produced a bumper crop of acorn squash and the fennel is still going strong. I saw this recipe that had the acorn squash cut in half moon slices about 1/2 inch think and roasted – it looked interesting. But I wanted to use the fennel too. Cut the acorn squash in half and remove the seeds (I roast the seeds in a small pie dish with a little salt). Cut the halves in half again. Slice in 1/2 inch crescents. 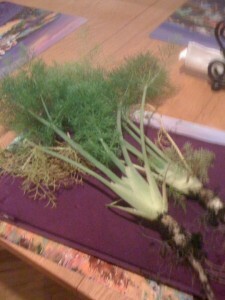 Slice the fennel – up to where it gets really leafy. Melt the brown sugar in the butter, whisk in the water. Arrange the acorn squash flat on pan with sides (a cookie sheet with low sides will work). Sprinkle the fennel over the top. Cover with the brown sugar liquid mixture. Flip over acorn squash slices to cover both sides in the brown sugar liquid. Cover and place in a 350 degree oven for an hour. Uncover and cook for another 30 minutes or until most of the sauce has soaked into the acorn squash. Monitoring and Control – watch the squash the last half hour and keep it in longer if the sauce is not all soaked into the acorn squash. Closeout – This is BETTER than candied yams and no animals were hurt in the creation of this masterpiece. Posted in recipes, Uncategorized | Comments Off on Thanksgiving 2010 – the best of……. Pulled this out of my New England garden in late November. Rather amazing it survived several weeks of hard frosts. Initiation – I picked up Barefoot Contessa’s “How Easy is That?” cookbook and wanted to try her Onion Fennel Gratin soup. I modified it a bit based on my personal preferences- it came out GREAT!!!!! Planning – I got most of these ingredients at a small neighborhood grocery store – nothing too fancy in this soup. 4 16 oz cartons of organic beef broth. 1 pound beef soup bones. For all my soups, I start the stock a day ahead of time and let it sit for about 24 hours in the fridge. This helps the flavor develop AND the fat solidifies on the top making it easy to remove. For my version, start with sauteing shallots in a couple tablespoons of butter, brown a pound of beef soup bones in the butter, and add 8 cups of organic beef broth. Simmer about two hours. Put it in the refrigerator over night. Melt about 1/2 stick of the cultured organic butter in a 4 to 5 quart dutch oven. Slice the onions in half rounds in about 1/4 inch strips. And slice the entire fennel stalk. Add all to the dutch oven. Cook about 45 minutes over low heat and covered until the onions and fennel are tender. Put in the wine and let it boil to cook off the alcohol. Add the salt and pepper. Remove the fat and the bones from the broth and add to the onions and fennel. Simmer for 30 minutes. Ladle the soup into soup bowls. Toast a slice of the bread and then float it on top of the soup. Sprinkle about 1/4 cup of the gruyere cheese on top of the bread. Put the soup bowl under the broiler for about 5 minutes to brown up the cheese. Serve immediately. Monitor and Control – Cook this on low temperature – it’s not a race to make this. Use a good quality dutch oven. I like the Le Cruset dutch ovens. Close out – I understand that this soup freezes well. I like doing this in the glass storage bowls so it can just go from freezer to the microwave for a single serving.